Nineteen years after its creation, the Broadcasting Board of Governors last week announced its new name: The U.S. Agency for Global Media. The reason, according to CEO and Director John Lansing in an Aug. 23 statement, is that the agency in 2018 is a “modern media organization, operating far beyond the traditional broadcast mediums of television and radio to include digital and mobile platforms. The term ‘broadcasting’ does not accurately describe what we do,” he said. 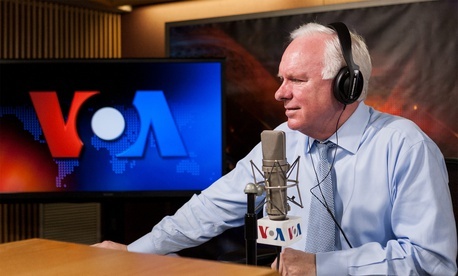 Spun out of the old U.S. Information Agency in 1999, the BBG and its successor are the umbrella body for five networks: the Voice of America, Radio Free Europe/Radio Liberty, the Office of Cuba Broadcasting (Television and Radio Martí), Radio Free Asia and the Middle East Broadcasting Networks. Together, these entities reach and “unduplicated” weekly audience of 278 million people in 100 countries and in 59 languages to bring professional journalism, rather than propaganda, to many closed societies. The name change was “a result of thorough research and extensive consultation with numerous internal and external stakeholders, including the BBG Board of Governors, agency staff and leadership at all levels, the five networks, Congress, the administration, and interagency colleagues,” Lansing stressed. An agency spokesperson told Government Executive they expected the new branding would cost approximately $25,000 for things like signage and paper products. The majority of changes will occur online. Though statutorily insulated from U.S. political influence, Congress and the Trump administration have mulled changes that might make the agency’s mission more responsive to U.S. policy. The website bbg.gov is still accessible, with a notice about the switch to USAGM.gov, which uses both names. But the recorded greeting at the agency’s central phone number continued on Wednesday to say BBG. This story was updated with information about the estimated cost of the transition to a new name.